Socks are very important to a runner. If they rub you the wrong way, it will make for a very uncomfortable run. Bunching up, toes too cold, too hot, rubbing - all things that can go wrong with a sock. I'm sure there are some other scenarios I've left out. Thanks to Tom and Kim at WrightSock, I had the chance to try some of their socks out. Since I wear a size 9 and my size is borderline between a medium and a large, Tom thought it was best for me to try out both the medium socks and the large socks. I was sent the Running II Double Layer Socks and the Merino TRL Double Layer Socks to try out. 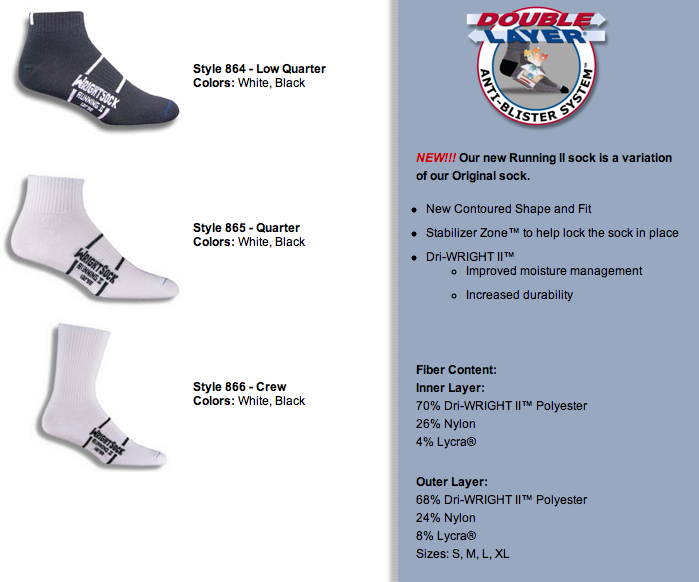 I've never tried out double layer socks before. Sometimes I have worn two pairs of socks in the winter, but there has been a lot of rubbing which has led to some unpleasant blisters. Yuck. First up, Running II sock, retail price $12.00. I tried out the medium and large in the quarter sock. I wore the mediums for my 12 miler with the girls on New Year's Day. They are very soft to put on and zero bunching up. I thought for sure there would be some kind of bunching and the need for adjustment since they are double layer, but none was needed. A few miles into the run, I realized my toes had never gotten cold in the start of the run. I asked Carrie about her toes and she said that she did have some chilly toes in the beginning. Score for Wright Socks, keeping my toes warm. And no blisters. I also really enjoyed the crew height of the socks. That little extra bit of height to the sock covered my ankles perfectly for the run. The next day, I tried out the size large. Immediately upon putting them on, I knew they wouldn't fit right. They had a lot of extra fabric around the toe area. Not good. Instead of trying them out, I took them off and handed them over to Ward and said "I think you should review these for me" and he did. After he came back from his run, he said they felt great, no moving around or bunching up. He is definitely sold by them. This is what the site says about the Running II. Next up, the Merino TRL: retail price $16. I've worn merino socks before, but they've always been too thick or itchy. However, Wright Socks has the double layer action going on and the inside is incredibly soft to touch and warm. Since I do have my January Streak going on, I have been blessed to be able to try out these socks on several occasions. It's been a little cooler this week with one night 15F (3F with the windchill) and another at 18F (10F with windchill). I thought those nights were perfect to try out the Merino TRL. I tried out the crew height. Again, a new height for me. Sometimes I put them on under my running tights and others I just put them on one top. Either way doesn't matter to me because both methods appeared to be comfortable. I did like how they kept my feet warm when both the air and ground were quite cold this week. At first, I did notice slightly cold toes, but within a 1/4 mile, my toes were warm again. There have been times last winter when I was 100% convinced my toes were going to break off because they were so cold and never warmed up on a run. I have high hopes for the Merinos this winter. I actually wore these socks yesterday for the January Thaw 4.5 mile race. They were absolutely perfect! Thank you, WrightSock! I switched out for the size mediums and went for my run. Zero rubbing, warm feeling. I love them. 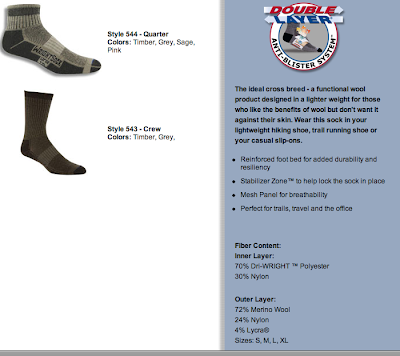 This is what the WrightSock website has to say about the Merino TRL socks. I really love these socks because they will serve me many purposes. Of course I will wear them for my cold runs but I can see them working out well for those cold, snowy recess duties I get the great pleasure of experiencing in elementary school life. I will admit, I wore these the other day with my grey wool pants and I was nice and toasty. Would you like the chance to win some of your own socks from WrightSock? WrightSock has graciously offered 1 pair of socks for 10 lucky winners. Giveaway will start today 1/15/12 and close on 1/21/12 at midnight. Void where prohibited by law. 10 winners will each win 1 pair of socks. The winners will be selected on 1/22/12 by using Random.org. Winners names will be posted on my blog on 1/22/12. The winners will have 72 hours to respond via email to runningwiththegirls AT gmail.com. If any of the original winners do not respond within that time period, a new winner will be chosen using the same procedure listed above. Wright Socks is the sponsor of this giveaway. Contact information is here. 2. You can “like” Wright Sock on facebook. Comment below. 3. Share - tweet, facebook, post on your blog. 1 comment each. Note: I did receive Wrightsocks free in in exchange for a review. All opinions here are my own and I was not required to give a positive review. I like wrightsock on facebook! I follow your blog GFC & RSS! Totally need a pair of good socks for winter. I always double-up on cold days. I like Wright Sock on FB now. I posted on my blog - in the sidebar about giveaways. Thanks for the chance to win! I only see one mandatory entry.... is #2 missing? And I do like WRIGHTSOCK on FB too. I am completely OUT of socks and I now live in a state where socks are required! 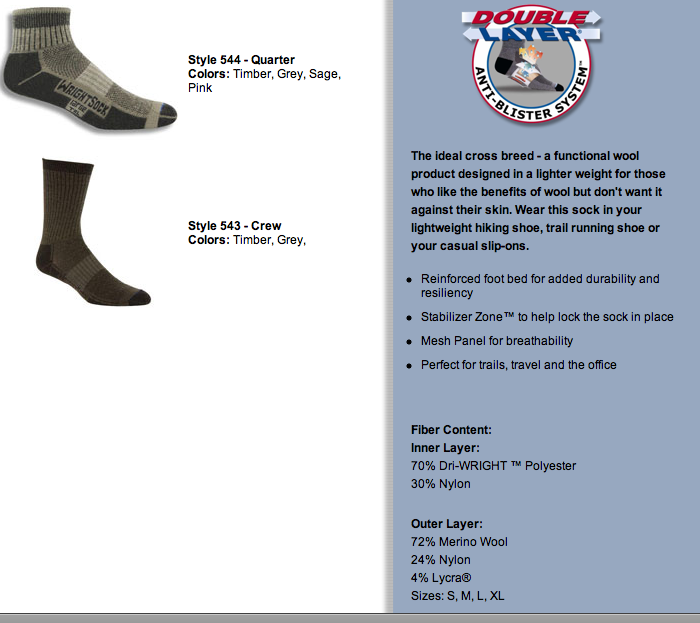 Great review -- I think I'm sold on these Wright Socks!! Of course I'm a follower!!!!!! I "liked" Wright Sock on facebook. I already "like" Wright Sock on the facebook! Added to my blogs sidebar! I follow your blog AND like wright sock on facebook AND shared this on my blog AND shared it on facebook! I liked Wright Sock on Facebook! I like Wright Sock on facebook! I follow you ;) obviously, you're awesome! I'm a follower using GFC! Liked Wright Sock on Facebook! I liked Wright socks on fb. I posted on my blog page about this giveaway. And I posted about your giveaway on my blog too! I follow via Google and Google Reader! And I like Wright Socks on Facebook! I like Wrightsock on fb. I posted your giveaway on fb too. "liked" wright socks... am really digging those turquoise babies! I Like Wright Socks on FB. I “like” Wright Sock on facebook (FB name: Maddie Brubaker). I follow your blog publicly as TurtleLisa. I "like" Wright Sock on FB! Im such a sock snob and would love to try something new! I like wright socks on facebook. I follow your blog, and love it by the way!